I remember a month before Mike Tyson fought Buster Douglas in Japan a poll was done with the boxing "experts" where Tyson rates all-time. 90% of these "experts" said Tyson is the greatest of all-time. When Roy Jones Jr. was at his peak 2 "experts" that were on the sport reporters show on Espn said Jones would beat a prime Smokin Joe Frazier. What a great country we live in to be able to make the money these "experts" make to state clueless opinions. They bring up that the Rams went 9-7 in 1979. Name me any team that loses 13 starters in the first 5 games. Lose your starting running back and two wide-outs. Have to play your 4th string QB. Take away Swann, Stallworth,Franco and Bradshaw and let's see what the Steelers record will be. And I forgot to mention the defense injuries. So going 9-7 is like going 13-3. And anyway isn't the playoffs the real measure of a team. For a defense that was the worst ever to play in a Super Bowl they set a NFL record that might be hard to break. -7 total yard for an entire game. Not bad for the worst. They had to play two teams in the playoffs that beat them by a total of 51-12 in the regular season. For Dallas, they created a defensive scheme called the "Quarter". (4 lineman 7 db's).It was so effective that tom landry known for his halftime adjustments couldn't figure it out. And befuddled Staubach so bad that his last pass he ever threw was to Herb Scott (only trouble with that it was his offensive lineman). One week later the ram defense turned in another gem shutting down the Bucs in the NFC Championship game. The bucs only crossed the 50 yard line 2 times for the entire game. Then in Super Bowl 14, playing one of the greatest teams ever. With a QB starting his 9th game. With your hall of fame pass rusher at 60%. The Rams had the lead in the 4th quarter. Only a blown assignment by eddie brown coupled with one of the greatest throws in a super bowl by Bradshaw along with the GREATEST catch EVER in a Super Bowl by Stallworth did we lose. We didn't play the 86, 87 and 89 Denver Broncos we played the Pittsburgh Steelers. Or that vaunted 89 Bengals team. I got to be honest with you, I was a "expert" too. Many years ago (too many) Arnold Swartzneggar was on the Mike Douglas show. At that time he was Mr. Universe. Mike Douglas ask Arnold what is his plans when he retires from body building tournaments. In a very thick accent he said "I want to be a actor". I start laughing and said "dude, you won't make dime one in being an actor." It has been 30 years (how can 3 long decades ago seem like 3 short weeks) since that magical season of 1979. It started out losing the greatest owner in sports on April 2nd, 1979. Then the front office turmoil. Losing players unmatched in NFL history. 21 players injured with countless new starting lineups. Pat Haden lost for the season. Vince Ferragamo breaks his hand. Cappaletti is lost for the season. John Williams and Doug Smith were lost for the season. Dennis Harrah missed time with a broken leg. Starting recievers Ron Jessie and Willie Miller had severe leg injuries. Their number one starting RB (Peacock) lost for the season. Starting defensive backs Rod Perry and Pat Thomas were out for weeks. They had to play 4 different QB's. After losing three straight games with a record of 4-5. Fred Dryer said "The media wants this to be the Titantic and it is not even close. The difference in being terminally ill and having a cold, we have a slight nose drip". Ray Malavasi and Bud Carson had great defensive minds, but, you get these two together and they became a monster defensive coach. For the Seahawks they created a defensive scheme called "delay-bim." It was so effective that it held a explosive seahawk offense to -7 total yards for the entire game. After that win Freddie says "Do you know what this win feels like? Like when the perfect woman walks into the bar at 1:55 in the morning and smiles at you". Ray Malavasi should of been coach of the year as he kept his team together winning a NFL record of seven straight division titles. For Dallas, they created a defensive scheme called the "Quarter". (4 dl and 7 db's). At half we had a 14-5 lead and started to believe is this our time. Then Vinnie throws that interception and Dallas takes a 19-14 lead. For us Ramfans that had our souls ripped from our hearts so many times. All those brutal images came rushing back of Ram disasters through the years. Joe Kapp hurdling over Ram defenders and Roman Gabriel getting sacked for that final safety, turning a 1969 Ram season that began 11-0 into a first-round playoff loss in Minnesota. Steve Preece and Eddie McMillan leaping for that underthrown Roger Staubach pass and smashing into each other, allowing the ball to float into Drew Pearson's hands for the touchdown that clinched the Rams' 1973 playoff defeat in Dallas. Tom Mack getting flagged for "illegal motion" (Mack still hasn't moved) on the Minnesota half-yard line in the 1974 NFC Championship game. James Harris throwing an interception in the end zone, sealing a 14-10 Ram defeat. The Rams went over 99 yards on a drive and get no points and lose by 4. Preston Pearson making diving catches in the end zone to lead the wild-card Dallas Cowboys to a 37-7 upset of the Rams in the 1975 NFC championship game. Nate Allen blocking that Tom Dempsey field goal try, Bobby Bryant running it back 90 yards and the Vikings beating the Rams again in the 1976 NFC title game. Then when Vinnie hit Waddy for the game winning TD we all went nuts. One week later the Ram defense shined shutting out Tampa Bay 9-0 in the NFC Championship game. In Super Bowl 14, the Rams did not play the 85 Patriots or 88 Bengals, they played one of the greatest teams ever, the Pittsburgh Steelers. With a QB starting his 7th game. And had the lead in the 4th quarter by 2. It took one of the greatest throws along with the greatest catch ever in a Super Bowl to beat us. I forgot to mention Eddie Brown's blown coverage. And still Rod Perry came within an inch of us winning. 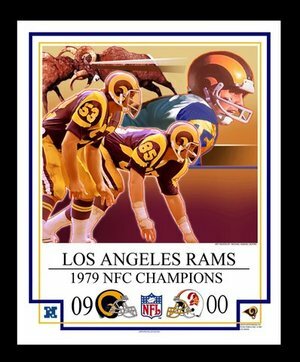 How special were the 1979 Rams to me? The experiences of meeting Ray Malavasi, Jack Youngblood, Dave Elmendorf, Rod Perry and Cullen Bryant that I cherish. Can you name me another team losing it's starting QB, RB and wide receiver for the season and coming within an inch of winning the Super Bowl against one of the greatest teams ever? What I cherish the most is Pat Summerall announcing to the world the starting Ram defense.